Blow-out bars are the latest beauty trend to hit America and are a great way to achieve an all-round great hair day with minimal effort involved! At each Dry Bar salon this rapidly growing beauty trend showcases a unique blow-out only service not a scissors in sight! Its quick, it’s easy and most importantly leaves you feeling happy and confident! With great styling options such as Mai Tai (loose beachy waves), Manhattans (sleek, pin straight locks), Southern comfort (Dallas inspired volume) and other signature looks you can’t go wrong when availing of this fantastic trend! With a flat rate price of $40 and an excellent service inclusive of a complimentary glass of champagne or wine during your appointment at Dry Bar you simply cannot go wrong! This unique beauty notion was started in LA in 2008 and now boasts a collection of over 24 salons. 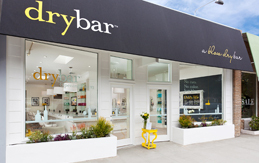 With salons being found nationwide from the East coast to the West and everywhere else in between it won’t be hard to find a renowned Dry Bar located near you.